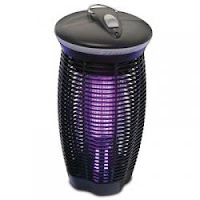 We recently got a bug zapper for our back patio. Once we got it set up we decided to turn off all of the lights in the back of our house so we could glow in the black light. Emilia was convinced it was a camera. She kept smiling at it and saying 'cheese' waiting for the 'flash' from the zapper to go off thinking it was taking her picture. Our little ham really loves to get her picture taken.